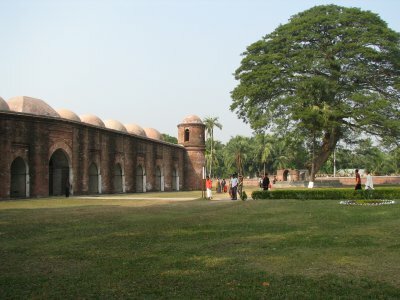 The Historic Mosque City of Bagerhat is a 15th century city with a high density in Islamic religious monuments. 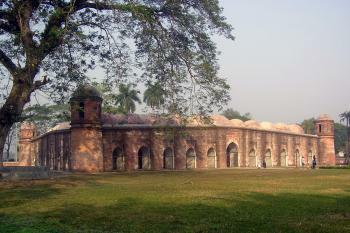 Bagerhat, the historical Khalifatabad, was founded by Khan Jahan, an Islamic preacher probably of Turkic origin. This Khan Jahan, about whom not much is known, adorned the city with mosques, roads, bridges, palaces and reservoirs. He established all of this within a short time span, while introducing a distinct architectural style. Only the mosques and Khan Jahan's shrine remain today. 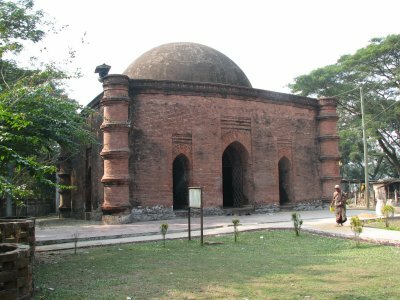 The lost city of Bagerhat now mainly consists of a number of mosques and the tomb of its founder, Khan Jahan. We start our tour at the 60-tower mosque (there are actually 77). Because a service is about to start, we do a quick round on the inside. 60 pillars, now mostly covered in cement, hold the roof of this largest mosque of its time. On the other side of the road is another small mosque, built in the traditional brick style. 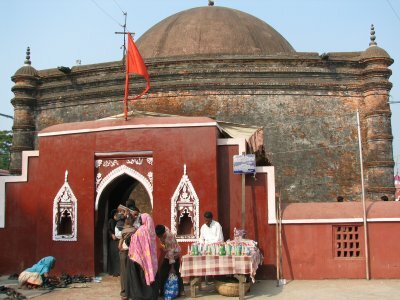 A few kilometers down the road is the shrine of Khan Jahan. This still is an active site of worship. It attracts both visitors and beggars. Because it's Friday when we visit, the museum is closed and the mosques are reserved for praying. There are a lot of Bangladeshi daytrippers around. Most of them are gathered near the large pond behind the Khan Jahan tomb. They are staring at / feeding a crocodile that lives in this pond. I had been there once to visit the sites including the tomb of Khan Jahan Ali. Beautiful places. The mosque built in a unique architectural fashion and also managed nicely up to this time. There is an amazing pond full of fresh water in front of the Tomb of the Saint Khan Jahan Ali. I strongly recommend the tourists to visit the site. I am a professional in the engineering core of the Largest integrated Dairy Farm of the world as per Guinness book of record. These inscribed monuments are titled “Bagherat” after the modern town situated nearby but are in reality those from city of Khalifatabad built in the 15th century by the Turkish Sufi general Khan Jahan Ali who became widely known as a warrior-saint. Little of the city remains visible apart from a number of Islamic buildings – mainly mosques, but also the tomb of Khan Jahan himself. These are important architecturally for being pre-Mughul in design. However the location is perhaps more highly revered by Bangladeshis as the country’s Islamic cradle than the buildings might appear to justify to the average non Bangladeshi visitor or architectural expert! The site is easy to get to from Khulna (and fits in well with a visit to the WHS of The Sundarbans) but the mosques are scattered in 2 main groups across several kilometres and require time to visit even if you have a car. The most significant building, is that of the Shait Gumbad Mosque (photo) said to be “the most magnificent traditional mosque in the country”. There are at least 7 other mosques to visit – mainly small square or rectangular buildings in brick with terracotta decoration and varying numbers of domes. At the Shait Gumba you are likely to be welcomed and shown the interior by the friendly Imam but you will probably be the only person around as you search out the other mosques by following footpaths among fields and ponds – in itself a pleasant way of spending time! The mausoleum building is rather busier with active worshippers and women are not allowed inside. I found the greatest interest in noting the similarity of building materials and, to some extent, style and decoration to that of Hindu temples I had seen earlier at Kantanagar and Puthia. The former is an absolute gem but is not even on the Bangladesh Tentative List. I wonder why? Bangladesh still has around 14% Hindu citizens and a Buddhist structure has been nominated as a WHS . Sufism: Founded by the Sufi Satin Khan Jahan. His mausoleum is within the inscribed area. Incorrect UNESCO 'Number of locations': shown as only having a single location but apparently having 2. "Today,the monuments of Khalifata-bad, which have been partially disengaged from the vegetation, may be divided into two principal zones 6.5 kms apart : to the West, around the mosque of Shait Gurrbad, renowned for its large prayer room, divided into seven longitudinal naves; and to the East, around the mausoleum of Khan Jahan. More than 50 monuments have been catalogued: in the first group, the mosques of Singar, Bibi Begni and Clumakkola; and in the second, the mosques of Reza Khoda, Zindavir and Ranvijoypur." (AB evaluation). 25 Community Members have visited.